Packing light doesn't just save you money on luggage fees; it also gives you more freedom to move around and explore. Here's the main thing to remember: It won't be a disaster if you don't have something when you need it during the trip. Here are a few things you should leave behind when you leave home. 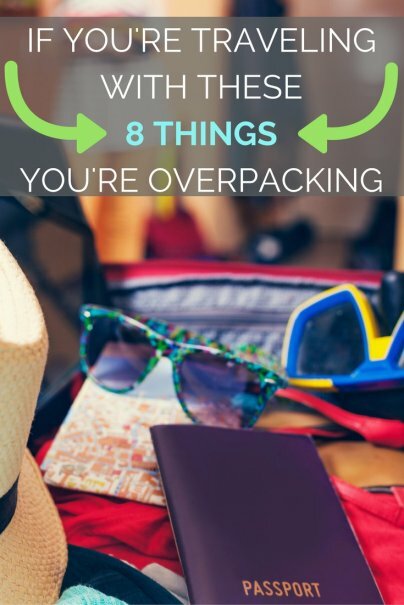 Don't pack 20 outfits for a 20-day trip. No matter how long the trip is, you only really need one week's worth of clothes. Don't worry about running out of things to wear; you'll be able to do laundry during the trip. The hotel laundry may be pricey, but there will definitely be a laundromat or a sink that you can use. Consider the climate, the environment, and the culture at the destination. You won't need a coat in Singapore or a sequined dress in the Amazon. If you're traveling to religious sites, don't pack anything that may be considered inappropriate there. Resist the temptation to bring bulky dress shoes. You'll probably spend a lot of time on your feet, so you'll need comfortable shoes or sandals. If you plan to eat at a fancy restaurant, then bring a pair of heels or dressy flats. Three pairs of shoes should be enough to cover all occasions. Most hotels and even some hostels provide basic toiletries, such as shampoo, conditioner, body lotion, and soap. They may not be your favorite brands, but they'll do the job. In the unlikely situation that they damage your skin or your hair, you can purchase other brands at the local drugstore. Only bring the items that you absolutely won't get at the hotel and only bring enough to last for the length of the trip. For example, I have acne-prone skin, so I have a bunch of medicated products that I bought from a clinic. I transfer them into small travel-sized containers and bring them along with me wherever I go, but I leave behind all other bathroom items. Leave your diamond earrings and designer handbags at home. You'll be exploring unfamiliar places, and it'll be a lot safer without flashy items that could potentially mark you as a target. If you want to wear your good jewelry to a special occasion like a destination wedding, then pack it in your carry-on bag. At the destination, leave it in the hotel safe when you're not wearing it. And because things can get lost despite your best efforts, check your travel insurance policy to see if it covers lost or stolen jewelry. Hair dryers and curling irons take up a lot of space. Maybe the hair dryer at the hotel won't be as powerful as you like, but it will only take a few minutes longer to dry your hair. Your hair can probably use some rest from hot styling tools anyway. If you can't style your hair as you usually do with the minimal tools you have in the hotel room, put it up in an easy updo. Or if you want to sport some curls, there are some no-heat curling methods that actually work pretty well. It's nice to dry yourself off with a big fluffy towel after a hot shower. But you should take that towel out of your bag because the hotel probably has an endless supply of towels. And even if you'll be staying at a hostel that doesn't provide a towel, you can save space by bringing a lightweight microfiber towel instead. Your little e-reader can store more books than you can read in a year, so there's really no need to pack a real book. But if you have to, bring just one and visit the hotel library or a local bookstore when you finish it. Instead of bringing a paper guidebook, choose a few important pages and photocopy them. Over time, I've found that I can get by with only the maps from the guidebook and some summarized notes on my smartphone. You may need a laptop for work, but will you also be using your tablet, e-reader, MP3 player, and all three cameras? Most gadgets are great at multitasking, so choose just a few of your favorite ones. You can read your e-book on your smartphone, for example. It won't be ideal, but it will only be for the duration of the trip. You also probably won't need to bring small appliances like an iron, a steamer, a coffee maker, or a humidifier. Just because the the box says "travel water purifier" doesn't mean you have to bring it on an actual trip! What do you leave behind when you travel? What do you wish you hadn't left behind? Please leave a comment below! I love how in number 7 you tell everyone to bring an e-reader instead of a hard copy of a book, then in the very next item, you tell everyone that an e-reader is unnecessary.